The funds were raised by nearly 600 swimmers, aged 7-85, who participated either in open-water or pool swims on Long Island during the summer of 2013. Cold Spring Harbor, NY - March 3, 2014 - The Swim Across America (SAA) Nassau Suffolk Committee recently distributed the net proceeds of its 2013 Swims - $500,000 - to six Long Island and metro area beneficiaries. The funds were raised by nearly 600 swimmers, aged 7-85, who participated either in open-water or pool swims on Long Island during the summer of 2013. Founded in 1890, Cold Spring Harbor Laboratory (CSHL) has shaped contemporary biomedical research and education with programs in cancer, neuroscience, plant biology and quantitative biology. CSHL is ranked number one in the world by Thomson Reuters for the impact of its research in molecular biology and genetics. The Laboratory has been home to eight Nobel Prize winners. Today, CSHL's multidisciplinary scientific community is more than 600 researchers and technicians strong and its Meetings & Courses program hosts more than 12,000 scientists from around the world each year to its Long Island campus and its China center. For more information, visit www.cshl.edu. Pictured: CSHL Director of Foundation & Government Relations Paula Smith and CSHL Associate Professor Raffaella Sordella accept a check for $70,000 from Swim Across America. 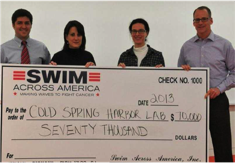 Subject: LongIsland.com - Your Name sent you Article details of "CSHL Lung Cancer Researcher Receives $70,000 from Swim Across America-Nassau Suffolk"